is daniel johnston alive or dead?? Re: is daniel johnston alive or dead?? That's him on the cover of "Discovered Covered. 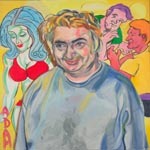 the Late Great Daniel Johnston." Actually, if you look closer, you'll see that he's been replaced by Paul McCartney. The clues are everywhere - like the dead tree and new sprout on the cover of the 1990 LP represent the passing of the "old" Dan and the installation of the "new" one. It's tough to tell, but the new one's voice is raspier. You can trust me on this! However... Keep in mind that I also believe Captain Crunch was assassinated by terrorists and surreptitiously replaced by a cleaned-up & brainwashed Yosemite Sam! I'm writing an expose on the cover-up, called "The Manchurian Galoot!" hahaha ^ that sounds about right.